Repeat- Writings on Architecture: Adler & Sullivan's Last Frame House on Hit List? It's a hot area for development. Just a few doors down on one-block-long Stratford, another vintage home on a similar-sized lot was recently torn down to make way for a 23-story residential high-rise - one unit per floor, starting at $1.3 million. The Harvey House parcel is zoned a more restrictive RM5, but that would still allow it to be replaced with a building up to five stories high with as many as ten units. Adler and Sullivan created some of the most important buildings of the 1880s and '90s, including the Auditorium Building and the Carson Pirie Scott store on State Street. Daniel Burnham may have built more and built bigger, but it was Sullivan who gave the Chicago School of Architecture its soul. He's credited with coining the phrase form follows function, a seemingly dry injunction that he made sing by transforming the newly emerging skyscraper-this sterile pile, this harsh, brutal agglomeration, this stark, staring exclamation of eternal strife-and making it every inch a proud and soaring thing, rising in sheer exultation. Like most architects, Adler and Sullivan also designed numerous homes- especially after Frank Lloyd Wright joined the firm in 1888- including Charnley House on North Astor. In little more than a decade of partnership, it's estimated that Adler & Sullivan completed over 180 buildings. Few survive, and their numbers continue to diminish. The past year has been especially unkind to Sullivan's legacy. Last August Hurricane Katrina flattened two cottages Sullivan designed in Ocean Springs, Mississippi, one of them for the aforementioned James Charnley, one of them his own vacation retreat. Then in January a fire reportedly started by a worker's blowtorch gutted the Pilgrim Baptist Church in Bronzeville, built in 1891 as the Kehilath Anshe Ma'ariv synagogue. Now the Harvey House may also be nearing its end. In 1962 the great Chicago architectural photographer Richard Nickel got a tip that the house was an Adler and Sullivan commission, and went to photograph its exterior. Eventually he was able to connect with the owner - the Bayer family, which had a famous linen shop in the Women's Athletic Club on North Michigan for years, says Ward Miller, executive director of the Richard Nickel Committee, an organization dedicated to preserving the photographer's work. Nickel was able to gain access and look at floor plans the Bayer family had that were by Adler and Sullivan. He was able to document the floor plans and convince the Bayers to donate them to the Art Institute. He also photographed the interior of the house." In late June, Miller talked to the son of the second owner of the house. Born in the house in 1917, he also grew up there, and could describe every room in detail. The original porte cochere and a wraparound porch he spoke of are both long gone, but he also described details that differed from those in the Adler and Sullivan drawings. Miller realized that some of those details, which he'd assumed were the result of remodeling, might actually have been changes the architects made before the house was actually built. For example, the son didn't remember the series of arches on the east porch, prominent in the drawings. The house he described was more streamlined than the one in the renderings, which Miller thinks might reflect Frank Lloyd Wright's influence. Today, Harvey House is in danger. It does not have the protection of being an official Chicago landmark. It's rated "orange" on the Chicago Historic Resources Survey, a listing of over 17,000 distinctive properties. At the top are 300 "red" rated buildings that are "potentially significant." The Harvey House is in the broad, "could be, might be" middle of 9,600 "orange" structures that have been judged, "potentially significant in the context of the surrounding community. By law, if someone applies for a demolition permit for an orange rated building, a 90-day hold is automatically placed on it while the Commission on Chicago Landmarks, a body appointed by the mayor, reviews the application and decides whether the building deserves to be saved. But the city has a record of letting orange rated buildings slip through the cracks, issuing permits even while the 90 day hold is supposed to be in effect, allowing buildings to be damaged or even razed before the commission can review the application. A permit was issued to demolish the south side's Saint Gelasius when the application was supposedly on hold (the church was later designated an official landmark). But by the time the workers left they'd already knocked down large chunks of the back of the building. The developer sued the Landmarks Commission, and at the July 12 commission meeting the staff presented a recommendation to withdraw the proposal to landmark the building. It's apparently part of a deal in which the developer gets to gut half the building and remove the lowest band of distinctive green Teco tiles in exchange for preserving the rest of the two street facades - and dropping the lawsuit. Activists like Preservation Chicago president Jonathan Fine thinks that switching from street addresses to unique taxpayer PIN numbers would reduce mistakes like Chicago Printed String, but Chicago Deputy Landmarks Commissioner Brian Goeken says improvements in the software used to track properties has already improved the situation. Because of the press coverage, a similar mistake is unlikely at Harvey House. "I am confident there is a hold" placed on property," says Goeken. 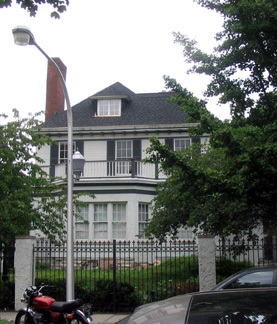 Still, saving the Harvey House could be a long shot. The city has a history of standing on the sidelines while Adler and Sullivan buildings that were among the most important buildings in the history of architecture were leveled. In the 60s the outrage over the demolition of their Schiller Building was the event that jump-started the architectural preservation movement in Chicago. But it still wasn't enough to prevent another Adler and Sullivan masterwork, the 1894 Chicago Stock Exchange, from being torn down in 1972. Richard Nickel died taking pictures in the rubble. Fine notes, however, that similar alterations have not blocked other structures' path to landmarking. The Reliance Building [by Burnham, Root and Atwood] had lost its cornice and the entire first floor was gutted out." Today, fully restored as the Hotel Burnham, its status as one of the most spectacular buildings of the 1890's is again fully in view. Another landmark, the 1836 Greek Revival Henry B. Clarke House, had an even more convoluted history. According to Fine, it was "moved from its original location, and then moved again. Its porch was rebuilt. Its cupola was built. Much of the detective work was speculative." That didn't stop it from being named a landmark in 1970, and it's now one of the glories of the city's Prairie Avenue District, landmarked in 1979, which also includes H.H. 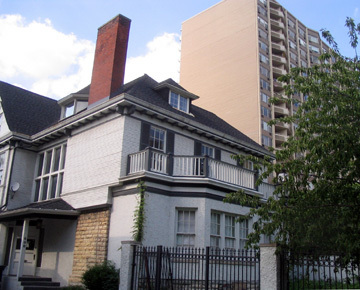 Richardson's Glessner House. Fine thinks the Harvey House offers up the same potential. "A frame building is the easiest building type to restore. The house itself tells the story. They can do amazing detective work. We have the techniques to put this house back to the condition in which the original architect intended." The case for the house isn't helped by its surroundings, however. It's one of only a handful of surviving vintage homes on Stratford. The rest of the block is a museum of dreck: four-plus-ones, ugly apartment blocks, and the service entrance of a generic condo tower on Cornelia that treats Stratford as if it were a back alley. By contrast, the next street south, Hawthorne Place, has a handsome terra-cotta-clad apartment building at the Lake Shore Drive end, and the rest of the block is filled with picturesque large old houses, most in the kind of pristine condition that speaks of loving care and lots of money. Why the big difference in streets just a block apart? 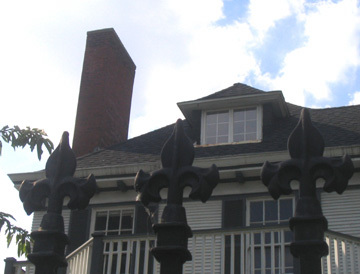 Hawthorne Place is an official landmark district. 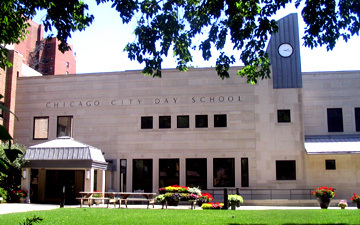 The existing buildings are protected, and any new construction is held to a high standard, one example being Weese Langley Weese's gracefully proportioned additions to the Chicago City Day School. Brian Goeken relates that at one point when the Hawthorne District was being considered, it had an arm that reached up to include three structures on Stratford, including the Sullivan House it's neighbor, and George W. Maher's gambrelled 1894 Albert B. Towers house, and the fact that they didn't make the final cut further complicates the situation by raising the issue of what t Goeken calls the "second-bite" provision, where a building, once rejected as a landmark, faces more stringent standards for reconsideration. Whether "second-bite" applies equally to nominated buildings considered, not individually, but as parts of a group, is an issue that Goeken says has been referred to the city's Law Department. Given its proximity to the lake and the short supply of single-family homes of its size and quality, not to mention its pedigree, a restored Harvey House would undoubtedly provide Ms. Frank a handsome profit should she decide to sell, though not as much as another stack of ugly condos. If she files for demolition, the ball will be in the city's court. It would be ironic if during this, the 150th anniversary of Sullivan's birth, Chicago lets yet another of his irreplaceable buildings slip through its fingers. July 28th Postscript. 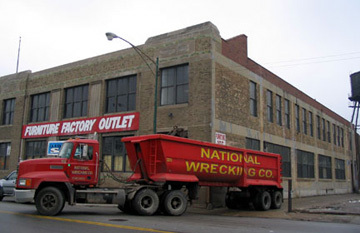 - The July 27, 2006 Chicago Tribune carried a story by architecture critic Blair Kamin reporting owner Natalie Frank has put aside plans for condos on the site that included creating drawings of a possible new building in favor of continuing renovations of the existing house. November 4th, 2006 - In a suspicious middle-of-the-night blaze, the George M. Harvey House was gutted by fire today. Read the sad story and see the pictures here.